Cumann: An Audio map of Drogheda is an artwork that acknowledges friendships, bonds and connections between communities of interest in Drogheda, within its surroundings and explores the potential relationships between them. 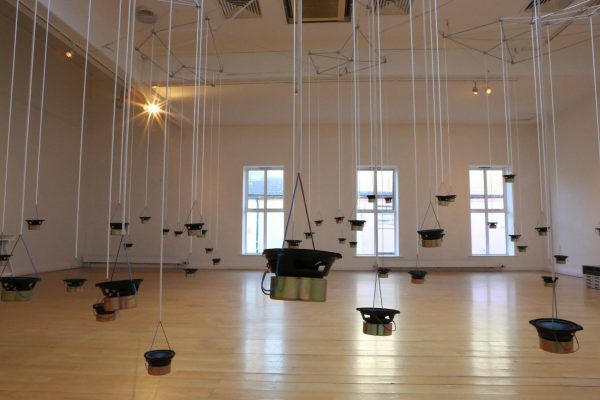 McLoughlin recorded audio conversations and connections between people representing society in its broadest sense and represented them as spatial mapped recordings in Droichead Arts Centre. This artwork was made in collaboration with Ablevision, Drogheda Homeless Aid, Drogheda & District Pigeon Racing Club, Boomerang, St Vincent de Paul, Bridge Jam, Old Drogheda Society, Connect Family Recourse Centre, Drogheda Chamber of Commerce, Drogheda Youth Theatre and Drogheda Local Voices. McLoughlin describes what he does as audio cartography. It’s a process of mapping the sonic space that conversations occupy, so they can be recreated during this exhibition, in 5 years time, or in 20 years time. Fittingly, after the exhibition in Droichead Arts Centre, the Cumann recordings will be housed in Drogheda, as part of the Drogheda Local Voices archive.